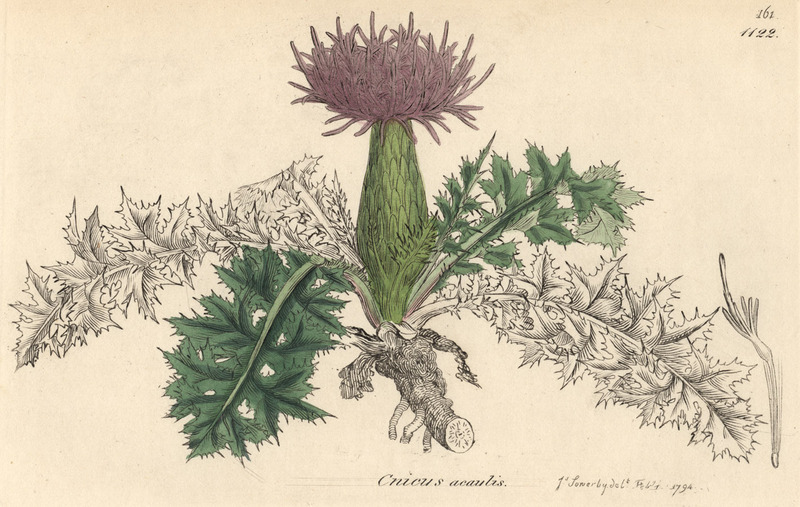 (lower image) “Cnicus Aculis: Plate 161: 1122”, 1794 (inscribed on plate). Size: (each sheet) 21.2 x 13 cm. For information on Sowerby’s illustrations, see http://www.illustratedgarden.org/mobot/rarebooks/author.asp?creator=Sowerby,%20James&creatorID=94 and http://en.wikipedia.org/wiki/English_Botany. 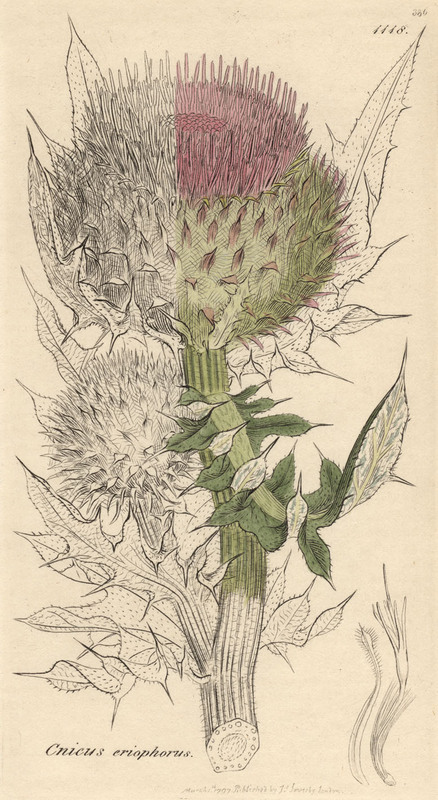 Condition: crisp impressions with exquisite hand-colouring (as published) in pristine condition. I am selling these four original engravings from the turn of the 18th and 19th centuries for the total cost of only AU$98 (currently US$70.87/EUR63.18/GBP48.67 at the time of posting this print) including postage and handling to anywhere in the world. 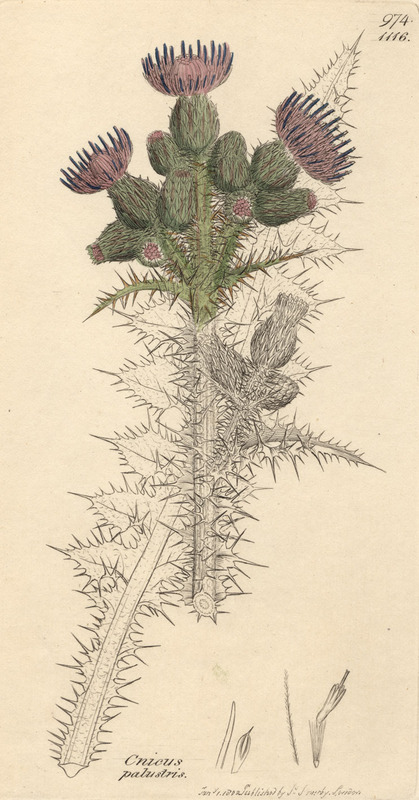 If you are interested in purchasing these small but stunningly beautiful illustrations of thistles, please contact me (oz_jim@printsandprinciples.com) and I will send you a PayPal invoice to make the payment easy. “Cnicus Pratensis, Plate 177: 1121”, 179? 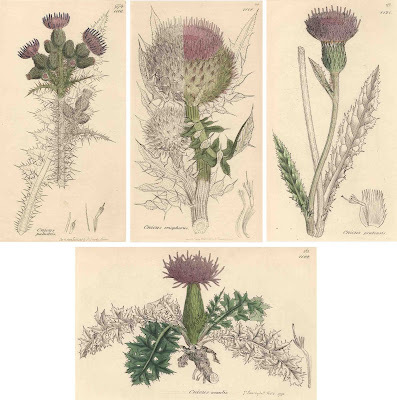 In case there are illustrators, especially botanical illustrators, who are not familiar with the engravings of James Sowerby, I strongly advise a quick stint of Googled research—his work is worth knowing about! Essentially, Sowerby is probably the most famous of all English botanical illustrators. 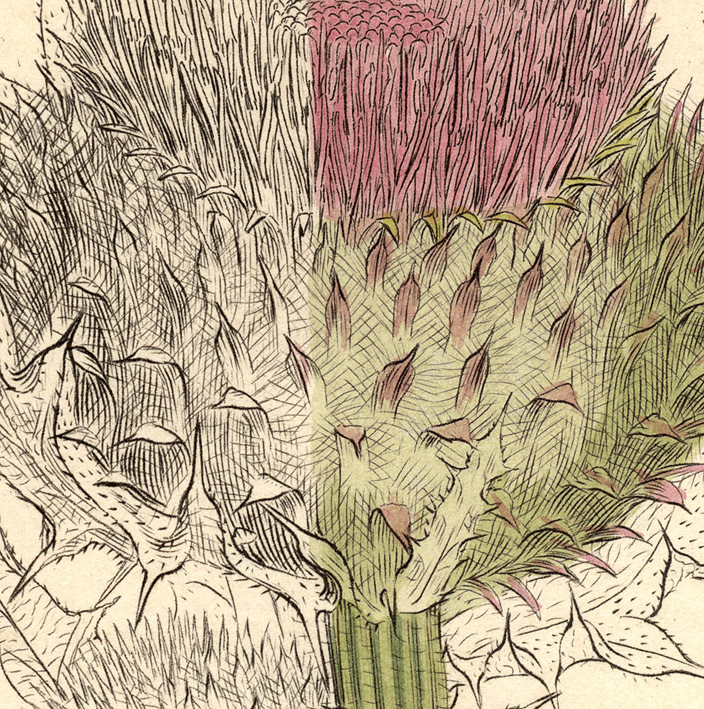 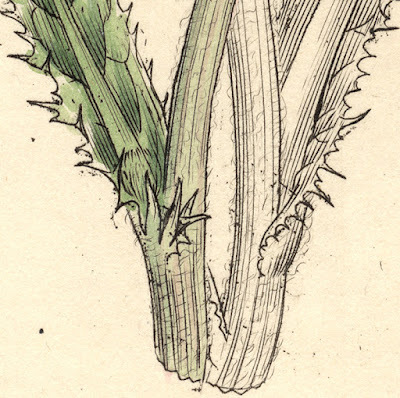 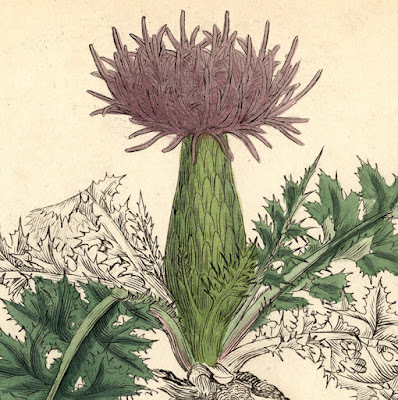 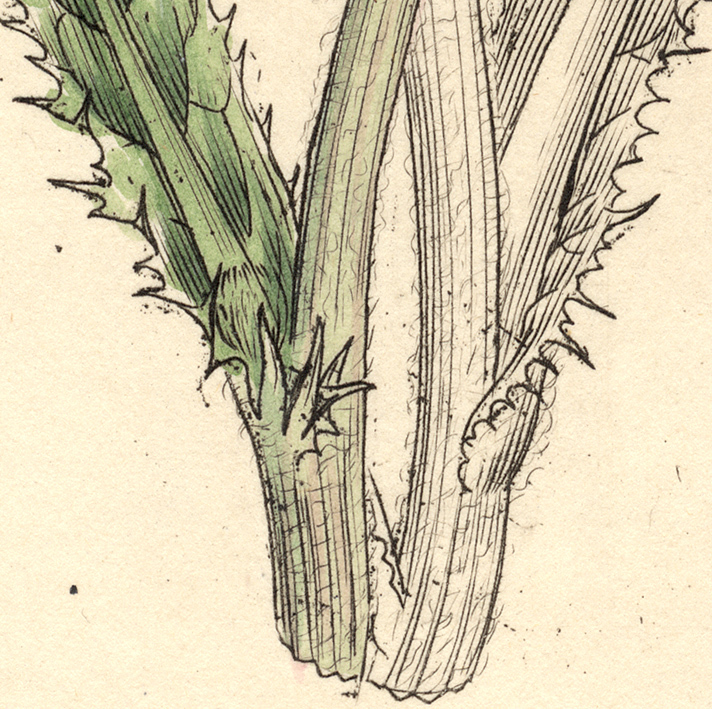 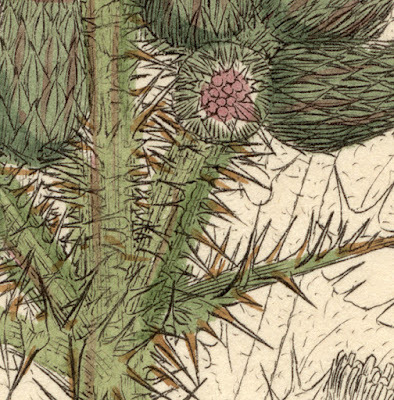 His fame rests marginally on the fineness of his engravings and their delicate hand-colouring, like the beautiful engravings of thistles shown here. 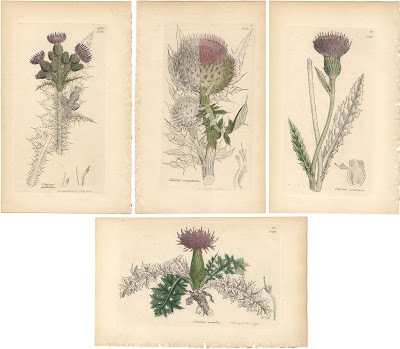 The real reason for his fame, however, is simply because of his publication, “English Botany”, that was released in “36 issues and 267 numbers, for over twenty-four years” (to quote Huber M Walsh, a volunteer librarian from Rare Books from the MGB Library). In short, it became so well known that it was THE periodical for gardeners and botanists. 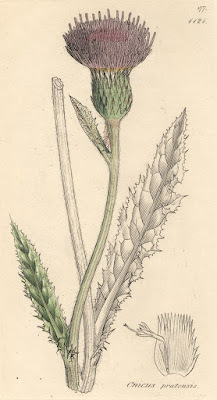 Going further, according to Walsh, even today “it is regarded as an authoritative reference source” (http://www.illustratedgarden.org/mobot/rarebooks/author.asp?creator=Sowerby,%20James&creatorID=94).